Ecosia is a search engine that makes you smarter and saves the planet at the same time. Sounds too good to be true, right? That’s why naturally the question arises whether Ecosia is a scam or legit. 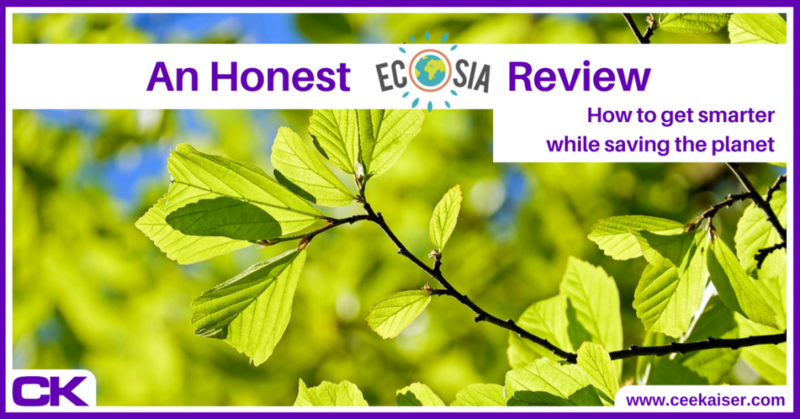 Find out for yourself – in this honest Ecosia review. 5 Is Ecosia Scam Or Legit? 8 You Can Make A Difference! For everybody not familiar with Ecosia yet: Ecosia is a search engine interface, which uses search results indexed by Microsoft’s search engine Bing and displays them in a familiar, Google-style layout. What makes Ecosia different from search engines such as Bing, DuckDuckGo or the mighty Google itself is the fact that Ecosia uses 80% of its ad-generated profits to plant trees. That means whenever you click a paid ad in the search results, you help to save this planet. If you are interested in where how many trees are being planet, Ecosia always publishes its monthly financial statements. Note: In doing so, Ecosia was the main inspiration for B’n’Tree: You book a bed, we plant a tree. Try it. We plant a tree every time you book a bed, at no cost to you. Ecosia was created by Christian Kroll, who had formerly founded similar green search projects such as forestle. It went live on December 7, 2009 – right on time for the Copenhagen Climate Conference. Due to its transparency and company philosophy Ecosia became Germany’s first certified B-Corporation in April 2014. Ecosia makes planting trees and saving the planet extremely easy. Once installed, you will never have to do anything else ever again to continuously turn search engine generated ad revenue into beautiful, CO2 offsetting, planet-saving trees. Adding Ecosia to Chrome, Safari, Opera, Firefox or any other web browser couldn’t be easier. Simply go to ecosia.org, and follow the instructions. If you can’t figure it out, you might not be the ideal individual to help save the planet. Or you’re sensible enough to appreciate that I wrote detailed instructions on how to install Ecosia and make it your default search engine a bit further down. Their full financial reports, including which tree-planting projects have been supported over the past months and years, can be found here. Certainly an interesting read! Ecosia takes your privacy serious. They encrypt your searches, don’t store them, don’t sell your data, and you can turn off all the tracking. Smart German engineering: Ecosia displays a search counter on the top right of your display, teasing your gamer’s instincts to push that number up as high as possible. Before you get too excited about how you single-handedly averted climate change: Only approximately every 45 searches pay for one more tree. But you did want to find out about every single Chinese alphabetic character and its meaning a long time ago anyway, didn’t you? Without trying to sound like Ecosia’s marketing maestro (I’m not): Ecosia does make you smarter. Because it gamifies search. Hence, it inspires you to search more often once you have Ecosia installed. Whenever I’m waiting for a bus, a buddy or a beer (or anything else), I used to whip out my phone and wait for the next WhatsApp message to arrive. Then, dejected, texting random contacts random messages to receive random replies. Thanks to Ecosia that’s a pastime of a past time. Now I’m planting trees while waiting for my Weizen. And to do so, I need to come up with interesting search topics. So I learned about the world population of grey wolves and Bengal tigers (gosh – did you know how endangered they are?! ), the massive contribution of India and China to overpopulate our planet soonest, what ‘Oregano’ actually means as well as fascinating magical illusions, a couple of time-saving lifehacks and how to solve a Rubik’s cube (almost there!). That’s pretty good for time I would have otherwise wasted on meaningless chat conversations. Any other suggestions what to learn next? Drop me a comment below, please. Means: Every time you turn on mobile data, or activate your WiFi, you’ll be reminded by Ecosia to start yet another search, and help yet another little bit to save the planet. Why did no other search engine think of that yet? I wonder why the question what Ecosia costs arises at times, but maybe that is because Ecosia sounds too good to be true. A search engine that makes you smarter and plants trees to help save the planet at the same time? Where’s the catch? What’s the cost? Relax, and rest assured: Same as other search engines, using Ecosia costs nothing. Again, same as other search engines, they make their money by displaying ads, and they charge their advertising partners for that, not you. When asking a wide Facebook community from all walks of life on their Ecosia feedback, the only downside occasionally being mentioned is Ecosia’s partner – Bing. Nonetheless, most people agreed that Bing (aka Ecosia) is perfectly suitable for most everyday searches. For me, Ecosia does the job just fine for approximately 91.3% of my searches (but who’s counting?). And should your search results not deliver the desired answers, simply Ecosia for ‘Google’. Is Ecosia Scam Or Legit? A green search engine that makes you smarter while saving the planet? Sounds too good to be true, right? But fear not – sometimes life just is as amazing as it sounds. Even Scamadviser rates Ecosia as 100% safe. Should that not be convincing enough for you, send the Ecosia team an email. Chat them up on Facebook. Or go visit them in Berlin. If you’re still not satisfied, ask yourself: What have you got to lose? Ecosia is completely free to use, so you might as well give it a shot. Please help to contribute to further sensational success stories like the below. By November 2017, Ecosia had planted over 15 million trees worldwide! To read about Ecosia’s recent achievements, take a quick look at their blog. Especially the stories about Ethiopia, the 2 friends who planted 5 million trees in one single year as well as the report on Madagascar are powerful. Now that you are entirely convinced that Ecosia is the next best invention after chocolate fountains, go install Ecosia. On your laptop. Your tablet. Your phone. On any online-search-capable device in your household. And in your neighborhood. Then go conquer the world! No matter whether you use Chrome, Safari, Firefox, Microsoft Edge, Internet Explorer (really? ), Opera or any other web browser, installing Ecosia and making it your default search engine couldn’t be any easier. 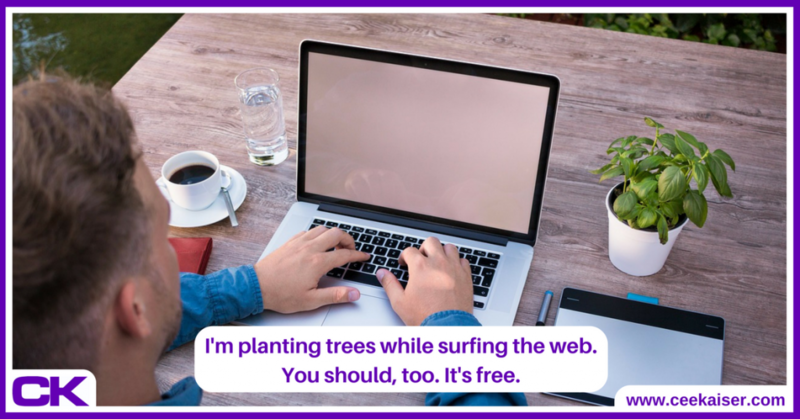 From then on, you’ll automatically plant trees by browsing the internet. How cool are you? You deserve an award. Now tell your friends about it! The more trees we plant, the better! Share this image with your friends and family to encourage them to use Ecosia as well. Simply visit Ecosia.org and follow the instructions. As a standard skilled internet user with a standard internet speed, you’ll be done in 13.3 seconds. If you manage to beat 6.8 seconds, I might have a job for you. Clock’s ticking! Ecosia developed apps for both Safari and Android. As soon as your device is small enough to support apps, simply visit the AppStore or Google Play and download “Ecosia”. Install it on your iPhone, tablet, backup smartphone, Chromebook and all of your friends’ and family’s devices. The more, the merrier. And then help spread the word even further! We already established above that you do deserve an award for planting trees while searching the web. Now help others achieve this as well. Spread the word by sharing this article. All together we will make a massive difference!